, we’re making it faster and easier for you to get the information you’ve searched for on your browser, right on your Android phone. Just make sure you’re signed in to Google Maps and your web history is enabled to get a number of new benefits including search and directions history. 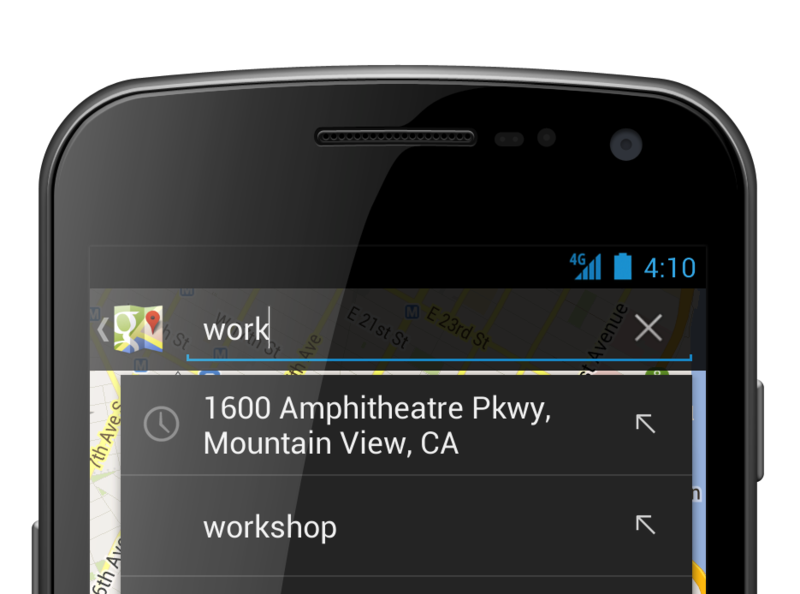 When you start to type a place or directions into the search box on your Android device, you’ll see suggestions for directions and locations that you’ve previously searched for – making it easier to quickly find directions on the go. Desktop and Mobile search synchronisation. 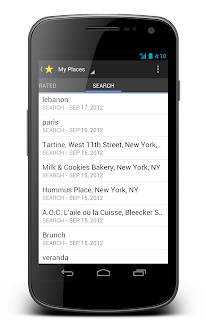 You can also see your mapping search history, as well as your directions history, on your Android phone by going to the “Search” or “Directions” tab under My Places. This way, places and businesses you have already searched for will show up in your suggestions to save you time when you’re out and about. Access your search history under My Places. Also, as in previous versions of Google Maps for Android, when you chose to set locations such as “home” and “work", you can quickly access directions to these places by simply typing “home” or “work” in the search field on your mobile device. Searching for work automatically suggests your work address. We’re always working to make your Google Maps experience more comprehensive, accurate and useful across all devices. To learn more about these features you can visit our site. When you’re on the go, it can be difficult to recall all of the places you’ve searched on your desktop browser at home. To make Google Maps more useful and comprehensive, we added a few improvements to better sync your maps experience across all of your devices. Today, with the latest release of Google Maps for Android, we’re making it faster and easier for you to get the information you’ve searched for on your browser, right on your Android phone.